Kit: Hey...Paula...good news. It's Champagne Thursday. Kit: Uh, yeah. Thursday came twice this week. So I'm totally giving my inspiration away early this month...but really that's only part of it (the main part, but still). 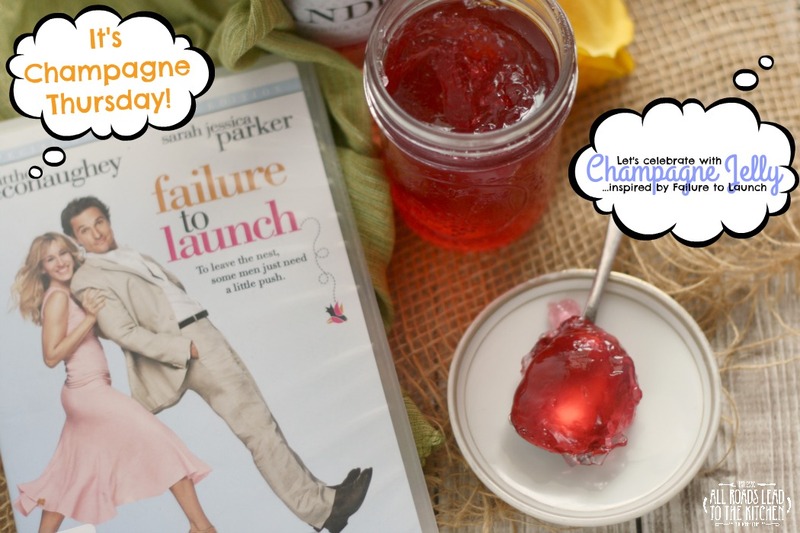 If you're familiar with Champagne Thursday, that means you're familiar with Failure to Launch, our Food 'n Flix pick to kick of 2016. I couldn't think of a better way to kick off a new year since Champagne (or a least sparkling wine) and new year's celebrations go hand in hand. I'd seen Failure to Launch a few times already, once when it first came out on dvd and again in bits and parts when it's been on tv. But I don't remember ever noticing just how much food is actually in this flick, starting with the opening sequence when our lead male Tripp (Matthew McConaughey) staggers out of bed and onto the Santitas Tortilla Chip bag on his bedroom floor. But I'm getting ahead of myself. In case you haven't actually seen this one, in a nutshell, it is a rom-com about 30-something Tripp who still lives at home with his parents, who, in a push to regain a little "them" time again, hire Paula (Sarah Jessica Parker), who makes a living of covertly enticing grown men to move out of their parents homes, to help them. But of course, it's never that easy. Tripp starts to actually fall for Paula, who falls for Tripp, who finds out she was hired by his parents, who realize they're actually falling in love. With some comic relief from Tripp's adorable and somewhat goofy buddies Ace and Demo, Paula's roommate Kit, and a "devil bird", it winds up being a funway to spend 90 or so minutes. Back to the food. There's everything from an extensive breakfast spread of orange juice, pancakes, eggs, bacon, sausage, coffee, and fruit to Mexican food and margaritas to a cookout featuring a cocktail named the "Guava Smasher". There's iced tea and cookies, chips and salsa, asparagus, bread, chocolate power bars and peanuts, Japanese cuisine (including squid), crab legs dipped in butter, rolls, and beer. There's also a big meal towards the end that while lavish, is never truly revealed to us. But that little dialog between Paula and Kit that I shared at the top of this post was my ultimate inspiration. I mean come on...Champagne Thursday! Plus, there was a scene where Paula comes home looking all lovey-dovey and Kit is drinking champagne while making herself a peanut butter and jelly sandwich...and that is what ultimately sealed the deal. 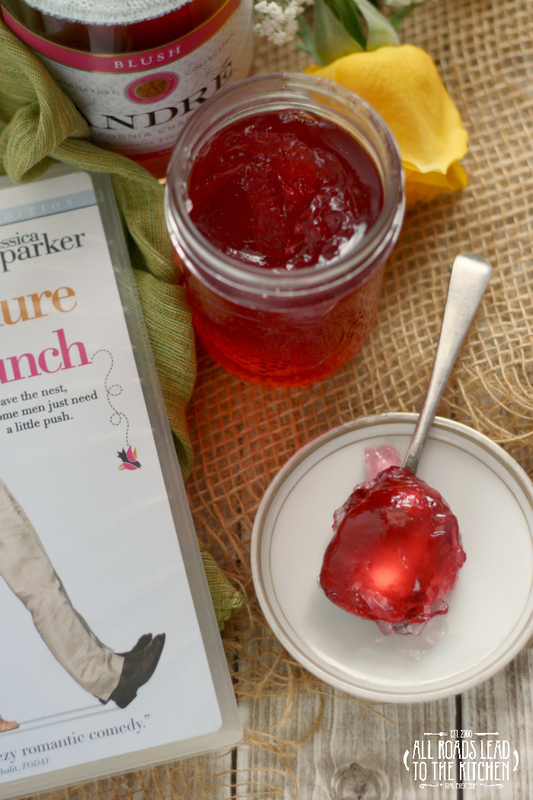 Champagne + Jelly = Champagne Jelly! 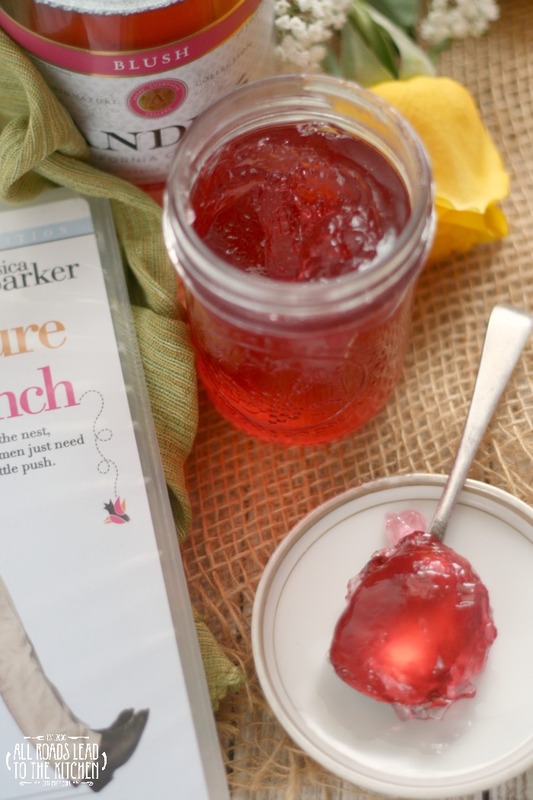 So you could totally use this simple, but incredibly tasty jelly in a grown-up pb&j sandwich (although I'd recommend using almond butter and toasted bread for the best flavor), but I think it would also make fun bridal shower or wedding favors! Play with the flavors a bit, switch up the type of champagne (you don't have to use blush) - I think this simple recipe lends itself to all sorts of fun interpretations. It's also really good with brie (room temperature or melty from the oven) and bread or crackers. Paula: Hey, what's the Champagne about? This month's edition of Food 'n Flix is being hosted Amy at Amy's Cooking Adventures with her pick, Failure to Launch. If you'd like to join us, just watch the flick, head into the kitchen and whip up something inspired by it, then create a blog post from it by January 28th! Next month we'll be watching The Lunchbox, which is being hosted by Camilla at Culinary Adventures with Camilla. 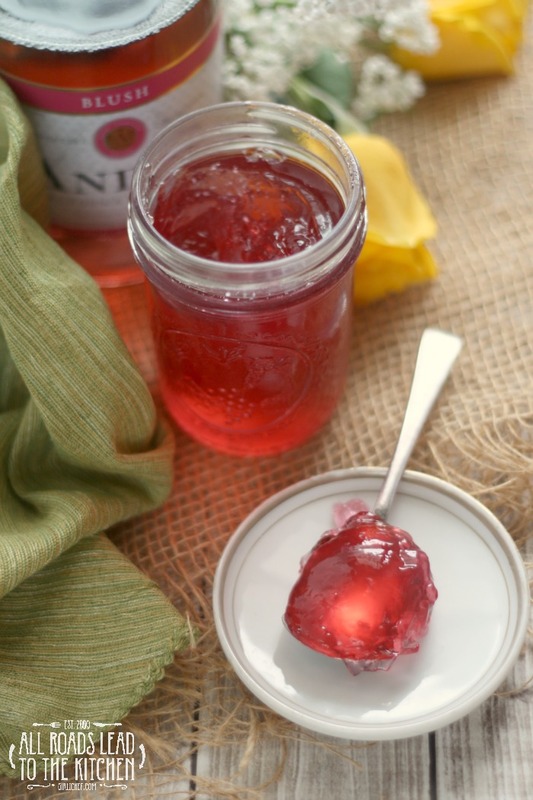 This beautifully blushed champagne jelly is both delicate and decadent. It's perfect for Valentine's Day, appetizers, and bridal shower gifts! Combine the champagne and lime juice in a medium-size, nonreactive pot and scatter the pectin over the liquid; whisk to combine. Turn the heat on to medium-high under the pan and add the butter, rosewater, and vanilla; continue to whisk occassionally until the mixture comes to a boil. Pour in the sugar, whisking as you go to help it dissolve. Bring the mixture back to a full and heavy rolling bowl, whisking often, then let it boil hard for 1 minute. Remove pot from heat. If there is any foam, skim it off of the surface. Ladle the jelly into hot sterilized jars. Allow to cool to room temperature, then put on the lid and refrigerate until ready to use. Will keep in the fridge for a month or so. This jam isn't as sweet as some, but its champagne base is incredibly rich. You could add up to 4 cups (so 1 cup extra) of sugar in this recipe if you wish. I like it as written. Can you process this in a hot water bath or flip it upside down to seal? Yes, go for it! ©All Roads Lead to the Kitchen. Inspired by this recipe at Serious Eats. I want to hear about it! Please let me know by snapping a photo and sharing it in the comment section below the recipe by clicking the little image icon in the bottom left hand corner of the comment box. You can also share it on my Facebook page or upload it and tag me on Twitter or Instagram using hashtag #allroadsleadtothekitchen in the caption (I will only be able to see it if your account is public).